NOTE: I watched the film in Real 3-D. 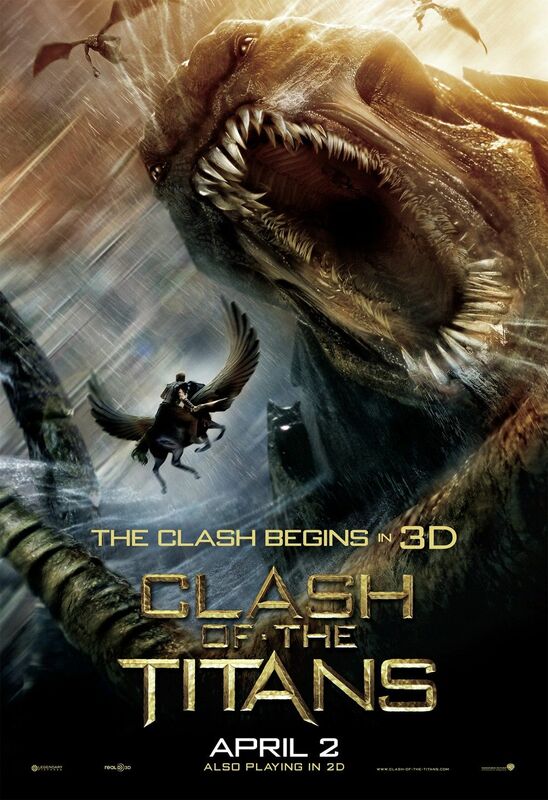 I was all of four years of age when the original “Clash of the Titans” was released in 1981 and like every kid who grew up in the Eighties, I’ve watched the original at least a dozen times. Not to have a “back in the day” moment, but mythology was one of those cool things that sprang up on occasion. There was only one universal book on the subject by Edith Hamilton and aside from the fact that my “gifted”/really intelligent kids program did a unit of study on it, I might not have known anything about it save for the fact that the movie production company Orion was named after the constellation named for the mythological character. I have no idea or clue if kids are interested in it nowadays. This remake directed by Louis Leterrier (“The Incredible Hulk”) brings back that since of nostalgia for Perseus, Zeus, Athena, Io, and the myriad of characters that deep down we find fascinating. Mythology envelopes us in a time and place where incredible feats were accomplished and the gods did way more than just place dice with the universe. Perseus is a baby laying on his dead mother’s body inside a coffin when he’s picked up by a fisherman (Pete Postlethwaite) who brings him up as his own son. On a particular trip in his late teens Perseus (now a grown Sam Worthington) and his family watch from their boat as the tides of change have enacted against the gods and a ginormous statue of Zeus is being toppled from a cliff by soldiers. The world of men no longer needs the gods; they can make their own. Which doesn’t bode well on Mount Olympus where Zeus looks down to see that Man has turned against him. He needs the love and worship of Man to have power and he’s quickly losing it. When his brother Hades (Fiennes) shows they make a deal to teach mankind a lesson, not knowing that Hades has bigger plans. In the meantime Zeus sends winged creatures to pick-off the soldiers and Perseus’s family drowns when their boat is capsized by the falling statue. At Argos a ceremony is being held by the king and his wife who decry the gods and goddesses. When the queen states that her daughter Andromeda (Alexa Davalos) is better looking than the goddess Athena, Hades makes his play on the kingdom of Argos: unless the king sacrifices his daughter for his wife’s insolence to Athena, the kingdom of Argos will be destroyed in ten days. Oh, and by the way Persues, the guy they pulled from the ocean, is a demi-god. Thanks. Which causes Perseus a lot of problems. First off he blames Zeus for the death of his family. Second, the gods aren’t exactly winning any population contests with the people. Third, he’s just a fisherman and really doesn’t want to answer to being any more than what he is (an ongoing theme in the film). Meanwhile, we find out more about the birth of Perseus. His father Acrisius (Jason Flemyng) got screwed-over by Zeus in the beginning of Man’s war against the gods when Zeus came to Earth in the form of Acrisius and made out with his wife. Acrisius finds out, Zeus flees the scene and Acrisius waits until Perseus is born before putting his wife and him into a coffin and throwing it into the ocean. The demi-god Io (Arterton) guides the coffin to the boat of a fisherman while Zeus punishes Acrisius by deforming him (he now becomes Calibos) and banishing him to be Hades’ neighbor. Speaking of, Hades hires Calibos to kill Perseus because he has big plans. Perseus meets Draco (Mads Mikkelsen) the leader of the Argos soldiers sent to prevent the death of Andromeda by… whatever. We in the theater (and at home) know it’s the Kraken, but the characters aren’t exactly sure what’s going on or really where they’re going; for all they know they could be on a suicide mission to chuck a ring into a volcano. They pick up two travelers and a Djinn (decrepit guy who can wield ancient magic) on their way to the witches and to Medusa and finally back to Argos to save the princess and keep Argos from being obliterated by the Kraken. It’s better than I thought it would have been. Honestly. I loved growing up watching the original and was more than cautious on seeing this one. Having picked up the original on Blu-ray I can see it through a different set of eyes and –yes- it’s not the greatest movie since the train station one by the Lumiere Brothers, but it’s good and worthy of seeing at a theater. Leterrier’s remake parallels the original but keeps its distance. Instead of “one man making a journey” it becomes a sort of “Fellowship Against the Kraken.” In the original Perseus went through self-imposed training to become PERSEUS and save the day whereas in this version the character doesn’t want to answer “the call of destiny” opting to rebel against it either because he just wants to be a fisherman or his self-esteem really is that low. The white Pegasus was traded for a black one, and the Kraken is a verifiable sea monster with tentacles as opposed to the giant Harryhausen creation. My main complaint on the movie is that it lacks imperative nature. At no point in the film is there a time countdown; in fact, the film feels like it took place over two or three days at most. While there is camaraderie among the rag-tag group, they’re all sure of pursuing certain death so that Perseus can become who he needs to become in order to save Argos/the Princess/the day but Perseus doesn’t believe in himself nor what he’s being expected to do. Meanwhile, those around him get killed. And at the end of it all everything is righted again but it doesn’t stop from feeling underwhelming. And that’s a concern: that our culture has divided everything into being either super-soft touchy/feely or super-action hero incredulous; there seems to be no middle ground. This is a movie for a generation of kids who grew up on “Diary of a Wimpy Kid,” antidepressants, etc. On one hand not having more anima hurts this film and keeps it from being great. On the other, Leterrier makes a case about friendship, love, worship, the gods, and becoming one’s own self, regardless of fate or destiny. Another minor adjunct complaint: everyone in the movie seemed to know what was going on/what they had to do but ignored the audience. Maybe this is a “gutsy” move to make audiences think, or maybe Leterrier is harkening back to olden days when everything wasn’t explained to its final detail. I don’t remember what led them from one place to the next except for a clue, and not one person questioned what was going on. Maybe I’ll chalk that up to “lack of character development” and letting the characters serve the story. Special effect fight scenes were really well done. Acting was pretty good. The filmmakers attempted to take the original and make it their own and for the most part (given the source material) they did so. As for 3-D content… I have problems with 3-D glasses. Aside from putting them over my own I have a stigmatism and it takes ten minutes for my eyes to adjust to the image and as long as the picture stays in place I’m fine. The problem with 3-D (and me watching it as well) is when quick-cut fast-paced action sequences occur; they give me a headache. If you have the same problem, you may wanna skip seeing it in 3-D. I can recommend this as a good matinee film or you may want to opt for full-price. It’s good for a remake and I would consider seeing it again. Watch for Bubo (the mechanical owl) to make an appearance.